What It’s About: After a series of lawsuits effectively outlawed superheroes Mr. Incredible (Craig T. Nelson) is just another former hero forced to hide his past and work a dull ordinary job. When a mysterious communication summons him to a remote island, it sets in motion a series of events that will bring not only him, but his wife Elastigirl (Holly Hunter) and former ally Frozone (Samuel L. Jackson) back into action…along with the couple’s super powered children…. Why Watch it Today? : The Fantastic Four, just one of the comics that The Incredibles is a riff on, premiered today in 1961. 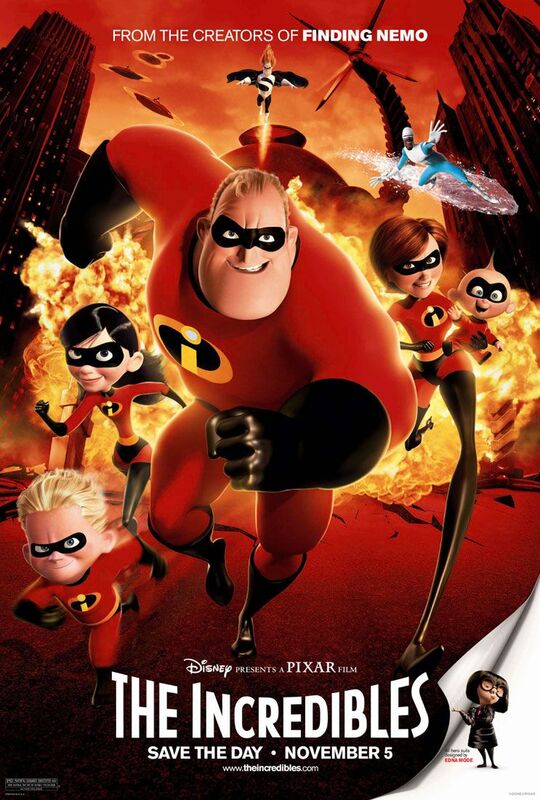 The Incredibles is one of the best comic book movies ever made, perfectly capturing and distilling several threads in comic history and giving us a family friendly version of the basic idea of The Watchmen that’s a better adaptation of that story than the official adaptation of the legendary comic book. This entry was posted in Action, Adventure, Animation, Comedy, Computer Animation, Family, Movie of the Day, Superheroes and tagged Best Animated Film, Best Original Screenplay Nominee, Best Sound Editing, Best Sound Mixing Nominee, Brad Bird, Craig T. Nelson, Elizabeth Pena, family, Holly Hunter, husband and wife team, insanity, Jason Lee, John Lasseter, John Ratzenberger, Pixar, private island, remote island, Samuel L. Jackson, Sarah Vowell, scientists, teens, uncharted island, Wallace Shawn. I don’t think I’ve met anti CG people rabid enough to hate on Pixar, but if I did this would be an excellent film to counter them with!